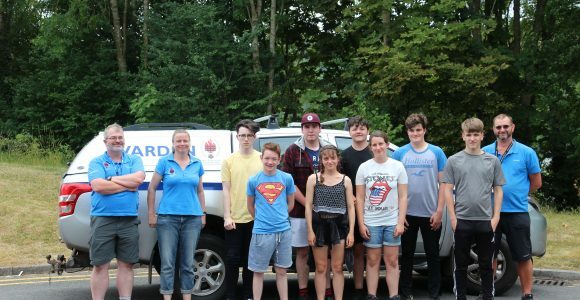 Nine local young adults have been given the opportunity to spend four days at Brecon Beacons National Park and gain experience within a range of vocational activities. The work experience program is part of a National Lottery Funded project taking place at the Glynneath Gunpowder Works at Pontneddfechan that is being managed and implemented by Brecon Beacons National Park Authority. The youngsters, aged between fifteen and seventeen, were provided with a taster of the different job roles that exist within the National Park Authority and completed activities ranging from archaeological digs to writing press releases. The Gunpowder Works project is focused on securing the historical site, which is a scheduled ancient monument, conserving its main remaining structures and bringing the site’s rich history back to life through interpretation. Through work experience, the young people have had the chance to engage with their local heritage and environment, whilst also learning new skills that will benefit them in the future.